MiamiHerald.com | July 16, 2014 | Ukulele Kids Club Inc.
Miami Herald article promoting a benefit concert for Ukulele Kids Club Inc.
Five-year-old Olando Edouardo had never played a ukulele before but, somehow, he made it look easy. He put the small wooden instrument on his lap, placed one thumb on the base and strummed the strings with his other hand. Playing music made the little boy forget — even for a few minutes — that he was in a hospital room and not church or his home. Donning a blue hospital gown and bracelet on his ankle, Olando sat in a chair next to his bed and smiled as he jammed with the hospital’s music therapists. 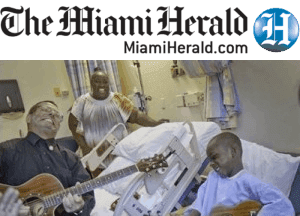 “I like music,” said Olando, who had just completed a nine-night stay at Miami Children’s Hospital to have surgery for urology issues. As a parting gift, Olando will be able to take home the ukulele donated by the Ukulele Kids Club, a non-profit organization that raises money to buy the instruments for children’s hospitals around the nation. Olando’s mom, Latoya Tucker, said the music program has been a light in the darkness. The music therapy program falls under the hospital’s Child Life Services department and is largely funded by the hospital’s foundation. Corey Bergman’s ukulele Kids Club is the only organization that gives the hospital instruments to pass on to patients to take home after they leave. Corey Bergman, who moved to South Florida two years ago, created the organization about six months ago after seeing the need as a volunteer in hospitals. Bergman, a guitarist, said a ukulele is the perfect size for children being treated in the hospital (“It doesn’t get in the way of tubes and wires,” he said) and that the ukulele is being used more often in popular music. So far, the Ukulele Kids Club has donated 150 ukuleles to more than 30 children’s hospitals across the nation, including Miami Children’s, Joe DiMaggio Children’s Hospital in Hollywood, Phoenix Children’s Hospital in Phoenix, St. Jude’s Children’s Research Hospital in Memphis, Tenn., and Memorial Sloan-Kettering Cancer Center in New York City. Each instrument costs about $40, and the organization sends five at a time to hospitals. The owner of The Guitar Nook, Lynne Sharkey and her step-daughter Jessica Burstein have planned a benefit concert with all proceeds going to the organization. The concert, featuring acoustic guitarist Richard Gilewitz, will be held Saturday. Music therapist Evelyn Laguardia said the Ukulele Kids Club has given her and other therapists the tools they need to help children through difficult times. Miami Children’s has already received 10 instruments, and she has given eight away. “It gives them a way to cope with what’s going on,” she said. On Wednesday, Bergman brought a new ukulele in its box to hand over to Olando at the suggestion of Laguardia. “He may be young, but he is definitely a musician,” Laguardia said. Olando, who was born with his organs outside of his body, has already had several surgeries. His mother said knowing he could work with the music therapists made it easier. Olando loves to sing, plays the drums and guitar at his church in West Park. His mom said the boy has already asked for a banjo and drum for his birthday. But the ukulele was an extra treat. Clutching the instrument tight, the little boy said he didn’t want to put it down. “It’s coming with me to church tonight,” he said.